Just polishing a post, the next in my series on Dublin gallery posts, following on from our last piece on William Dargan, the Great Exhibition and the origins of the NGI. But as a little teaser, can anyone tell me what this is? Who is the design by? For who, and for what ? And why was it never built? image courtesy of: Archiseek website. Wasn’t this a design for an art gallery to house the Hugh Lane paintings??? well done that man, well done Mr Mackin (?) take a bow. details to follow. next post in fact. T’is a jolly good yarn and all that. Ha ha, just spend several minutes looking that up before I see it was already answered. That Archiseek site is a treasure trove Aaron. and “Arran” 🙂 But you’re dead right Roy, it is a treasure trove. Nice to hear from you boss. 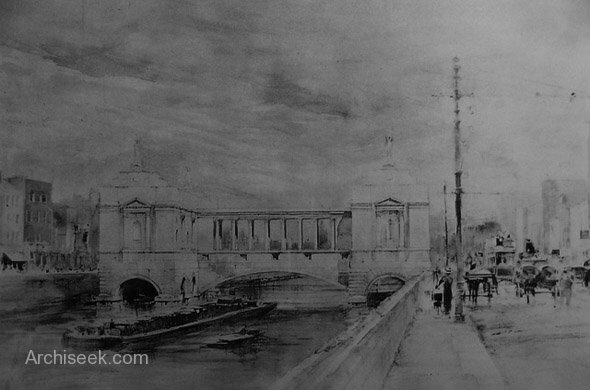 Previous Post William Dargan’s legacy: the National Gallery of Ireland. Next Post Egyptian Neo-Classical Architecture in Dublin: the Ripples of History. A self-indulgent & speculative wander, through ideas, history, and some favourite Dublin buildings.